These German-designed synthetic leather riding glove combines style and versatility. They fit like a second skin. Roeckl gloves are worn by professional riders because of their well known durability and tactility. The Roeckl-Grip textured palm provides excellent grip. There are no seams in any of the rein contact areas. Velcro hook and loop closures provide a secure fit. These gloves are machine washable. The Roeckl Chester glove is suitable for all riding disciplines. 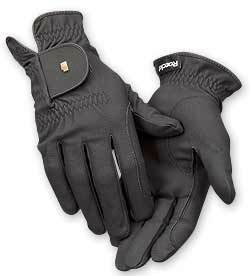 Riders that must wear gloves for long periods of time prefer them because of their comfort and durability. Don't know your glove size? Use a fabric measuring tape. Measure your hand around the widest part, excluding your thumb. The number of inches is your glove size.